Award winning quilter Betsy was on a flight to California to attend a national quilting convention when she got a call she did not expect: Gift of Life Marrow Registry had found her as a donor match for a leukemia patient. Betsy had been called as a possible match once before, and was impressed when she turned up at the lab for her blood work only to be escorted past everyone in the waiting room and taken in first. But that was 12 years earlier, and since she had not been selected as the donor that time she thought that was probably it – she didn’t expect to be called again. She clearly remembers joining the registry 18 years ago in April, 2000. A member of her congregation was seeking a donor at the time, and someone had arranged for Gift of Life to test people at the temple’s Purim carnival. Betsy and her husband were there, and were tested along with 797 others who hoped to be able to help someone. At that time, Gift of Life’s registry had just under 25,000 donors; today, there are more than 300,000. Now, 60 years old and on the verge of graduating from the registry, Betsy was being called not just as a possible match, a new blood test confirmed that she was the match, the perfect person to donate stem cells to a 64-year-old stranger fighting desperately to survive leukemia. Not long after the call, she met a women at a quilt workshop who thanked her, saying that her 13-year-old grandson was suffering from leukemia and was hoping to get a transplant. 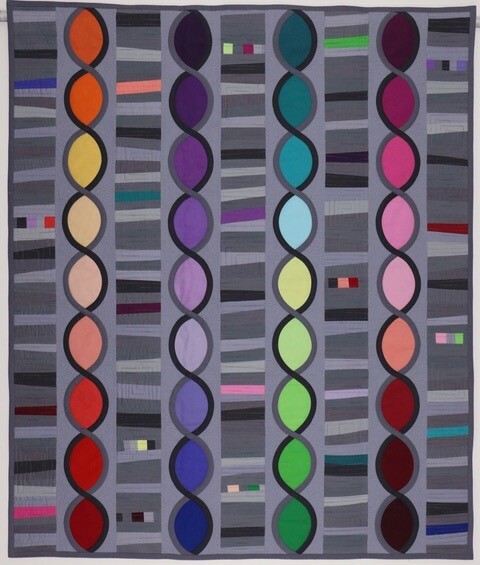 An example of Betsy's work is her 2014 quilt "Spare Change", a modern twist on the traditional Chinese Coins pattern. Only 30% of patients have a matching donor among family members. The other 70% must rely on the registry to search for a donor who shares their immune system factors. Gift of Life’s goal is to build the registry so that every patient can find a donor when one is needed. Betsy recovered from her donation quickly. “For me, recovery wasn’t about getting over donating, it was about getting over sitting in one place for a few hours!” she said. “If you get the chance to help someone, do it. It only took a couple days of my time to help someone with cancer, and I would do it again.” She hopes to hear good news about her recipient’s recovery soon. Betsy is an artist, creating beautiful quilts that have won dozens of awards at exhibitions and shows across the United States, and have been featured in books and magazine articles. Why is there an age limit on being a marrow donor? In the United States, donors graduate from the registry when they turn 61. Many people feel this is unfair, but there are compelling medical reasons why this rule is in place: younger donors produce a better outcome for recipients, health issues with older donors can delay transplant and jeopardize the recipient’s life, and just like all our bodily systems, our marrow ages. Read more about this important issue.